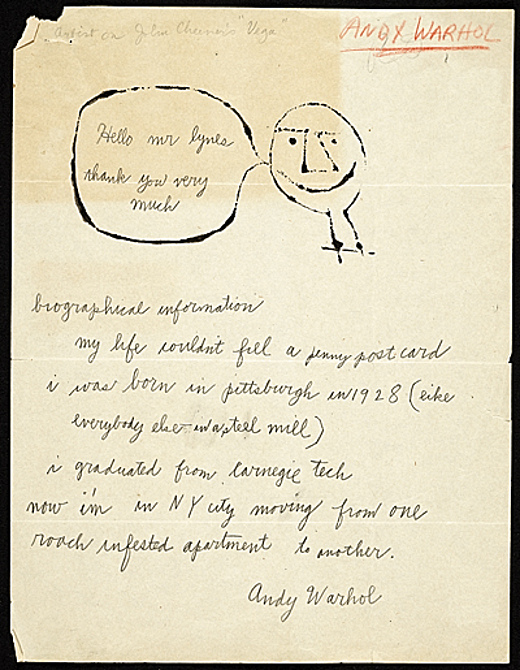 In response to a request for 'biographical information' by Harper's Magazine's managing editor Russell Lynes, 21-year-old Andy Warhol wrote the following self-deprecating note. It was 1949, Warhol had recently moved to New York following his graduation at Carnegie Tech, and he was already starting to impress as a commercial artist having just illustrated Vega, a short story by John Cheever which was to be featured in Harper's itself. Little did he or Lynes know, but his life story would soon fill many a book. now i'm in NY city moving from one roach infested apartment to another.